In response to the disproportionately high rate of type 2 diabetes in American Indian and Alaska Native (AI/AN) communities, Congress passed the Balanced Budget Act in 1997. This Act established the Special Diabetes Program for Indians (SDPI) as a grant program for the prevention and treatment of diabetes at a funding level of $30 million per year for five years. After extensive Tribal consultation, the Indian Health Service (IHS) distributed the funding to more than 300 IHS, Tribal, and Urban AI/AN health programs. In 2001, Congress increased the amount of SDPI funding to $100 million per year, and then again increased it to $150 million per year from 2004-2014. Current funding remains at $150 million for FY2014 with advocacy for reauthorization into FY2015 and beyond. USET, in collaboration with 20 of its member Tribal Nations, applied as a consortium for the SDPI funding under the premise that there’s “Strength in Unity”. USET’s SDPI grant program is unique in that all but a small administration fee goes directly to the participating Tribal Nations for program development, prevention and treatment of diabetes at the local level. USET continues to be the primary grantee and subcontracts with participating member Tribal Nations. The SDPI funds have allowed implementation of nearly 400 programs and enhanced diabetes care and education in AI/AN communities, establishing innovative and culturally appropriate strategies to combating the diabetes epidemic. 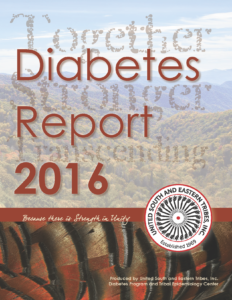 Each year, USET creates a Diabetes Report which tracks diabetes prevalence rates, individual Tribal indicators, areas for improvement and includes talking points consisting of statistics and other relevant information for use while preparing presentations, grants and general education purposes.